Úrsula Hilaria Celia de la Caridad Cruz Alfonso was born on October 21, 1925 in the diverse, working-class neighborhood of Santos Suárez in Havana, Cuba, the second of four children. Her father, Simón Cruz, was a railroad stoker and her mother, Catalina Alfonso was a homemaker who took care of an extended family. Celia was one of the eldest among fourteen children- brothers, sisters, and many cousins- she often had to put the younger ones to bed by singing them to sleep. . While growing up in Cuba's diverse 1930s musical climate, Cruz listened to many musicians who influenced her adult career, including Fernando Collazo, Abelardo Barroso, Pablo Quevedo and Arsenio Rodríguez. Despite her father's opposition and the fact that she was Catholic, as a child Cruz learned Santería songs from her neighbor who practiced Santería. Cruz also later studied the words to Yoruba songs with colleague Merceditas Valdés (an akpwon, a santería singer) from Cuba and made various recordings of this religious genre, even singing backup for other female akpwons like Candita Batista. As a teenager, her aunt took her and her cousin to cabarets to sing, but her father encouraged her to attend school in the hope she would become a teacher. After high school she attended the Normal School for Teachers in Havana with the intent of becoming a literature teacher. At the time being a singer was not viewed as an entirely respectable career. However, one of her teachers told her that as an entertainer she could earn in one day what most Cuban teachers earned in a month. From 1947, Cruz studied music theory, voice, and piano at Havana's National Conservatory of Music. Cruz began singing at Havana's radio station Radio García-Serra as a contestant on this station's popular "Hora del Té" daily broadcast, where she sang the tango "Nostalgias" and won a cake as first-place finisher. She often won cakes and also opportunities to participate in more contests. Her first recordings were made in 1948 in Venezuela. In 1947 Celia Cruz enrolled in the Escuela Normal de Maestros (Teachers'College) in Havana; however, began to enter amateur singing contest on local radio stations. After graduating in 1949, Cruz enrolled in Havanas' National Conservatory of Music, where she took she classes until 1950. She did not graduate from the conservatory; however, she soon joined La Sonora Matancera. Cruz's big break came in 1950 when Myrta Silva, the singer with Cuba's Sonora Matancera, became pregnant and returned to her native Puerto Rico. Since they were in need of a new singer, the band decided to give the young Celia Cruz a chance. She auditioned in June, and at the end of July she was asked to join as lead singer. She won the support of Sonora's band leader, Ro gelio Martínez, and went on to record hits such as "Yembe Laroco" and "Caramelo". Soon her name was bigger than the band's. 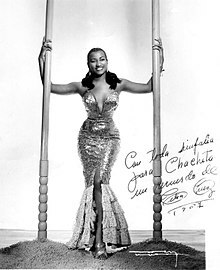 During her 15 years with Sonora Matancera, she appeared in cameos in some Mexican films such as Rincón criollo (1950), Una gallega en La Habana (1955) and Amorcito corazón (1961), toured all over Latin America, and became a regular at Havana's famous Tropicana nightspot. Cruz's 1974 album with Johnny Pacheco, Celia y Johnny, was very successful, and Cruz soon found herself in a group named the Fania All-Stars, which was an ensemble of salsa musicians from every orchestra signed by the Fania label (owner of Vaya Records). In Celia y Johnny, "Quimbará" became one of her signature songs. With the Fania All-Stars, Cruz had the opportunity to visit England, France, Zaire (today's DR Congo), and to return to tour Latin America; her performance in Zaire is included in the film Soul Power. In the late 1970s, she participated in an Eastern Air Lines commercial in Puerto Rico, singing the catchy phrase ¡Esto sí es volar! (This is to truly fly!). In 1976, she participated in a documentary film Salsa about the Latin culture, along with figures like Dolores del Río and Willie Colón. She also made three albums with Willie Colon (1977, 1981, 1987). With a voice described as operatic, Cruz moved through high and low pitches with an ease that belied her age, and her style improvising rhymed lyrics added a distinctive flavor to salsa. Her flamboyant costume, which included various colored wigs, tight sequined dresses, and very high heels, became so famous that one of them was acquired by the Smithsonian Institution. In 1990, Cruz won a Grammy Award for Best Tropical Latin Performance – Ray Barretto & Celia Cruz – Ritmo en el Corazón. She later recorded an anniversary album with Sonora Matancera. In the same year, she was recipient of the Excellence Award at the 1990 Lo Nuestro Awards. In 1992, she starred with Armand Assante and Antonio Banderas in the film The Mambo Kings. In 1994, President Bill Clinton awarded Cruz the National Medal of Arts. In the same year, she was inducted into Billboards Latin Music Hall of Fame along with fellow Cuban musician Cachao López. In 1999, Cruz was inducted into the International Latin Music Hall of Fame. In 2001, she recorded a new album, on which Johnny Pacheco was one of the producers. In March 2003, the Spanish-language television network Telemundo produced and aired a tribute special honoring Cruz, ¡Celia Cruz: Azúcar!. It was hosted by Puerto Rican singer Marc Anthony and Cuban-American singer Gloria Estefan. It featured musical performances by various Latin music and Anglo performers including Victor Manuelle, Paulina Rubio, José Feliciano, Milly Quezada, Los Tri-O, Estefan, Patti Labelle, Arturo Sandoval, Ana Gabriel, Gilberto Santa Rosa, Tito Nieves, Albita, Johnny Pacheco, Alicia Villareal, Olga Tañón, Mikey Perfecto, José Alberto "El Canario", Rosario, Luis Enrique, Anthony and Gloria Gaynor. On July 16, 2003, Cruz died of brain cancer at her home in Fort Lee, New Jersey, at the age of 77. Knight was there for her while she was going through cancer treatments. She had no children with her. After her death, her body was taken to Miami's Freedom Tower, where more than 200,000 fans paid their final respects. Multiple vigils occurred worldwide in cities such as Havana, Miami, and Cali (the Cali vigil became notorious in Colombian history due to its three-day span). Knight had Cruz buried in a granite mausoleum that he had built in Woodlawn Cemetery in The Bronx. Knight chose the plot on which it stands, which is near the gravestones of Duke Ellington and Miles Davis, because it was accessible to fans and had four windows built into it so that fans could see inside when paying their respects. Knight himself was buried with Cruz in the same mausoleum following his death on February 3, 2007. An epilogue in her autobiography notes that, in accordance with her wishes, Cuban soil which she had saved from a visit to Guantánamo Bay was used in her entombment. Through a formidable work ethic, Cruz rose to the very top in her genre; a genre that was traditionally male dominated. In February 2004, for her last album, Regalo del Alma, she won a posthumous award at the Premios Lo Nuestro for best salsa release of the year. It was announced in December 2005 that a musical called Azucar! would open in Tenerife before touring the world. The name comes from Cruz's well-known catch phrase of "¡Azúcar!" (“Sugar!”). In 2003 a music school was opened in the Bronx, named the "Celia Cruz Bronx High School of Music." Pedro Knight visited this school before his death to meet the students and share stories about her life. 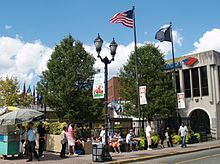 On June 4, 2004, the heavily Cuban-American community of Union City, New Jersey heralded its annual Cuban Day Parade by dedicating its new Celia Cruz Park (also known as Celia Cruz Plaza), which features a sidewalk star in her honor, at 31st Street and Bergenline Avenue, with Cruz's widower, Pedro Knight, present. There are four other similar dedications to Cruz around the world. Cruz's star has expanded into Union City's "Walk of Fame", as new marble stars are added each spring to honor Latin entertainment and media personalities, such as merengue singer Joseíto Mateo, salsa singer La India, Cuban musician Israel "Cachao" Lopez, Cuban tenor Beny Moré, Tito Puente, Spanish language television news anchor Rafael Pineda, salsa pioneer Johnny Pacheco, singer/bandleader Gilberto Santa Rosa and music promoter Ralph Mercado. On September 26, 2007, through May 25, 2008, Celia, a musical based on the life of Celia Cruz, played at the Off-Broadway venue New World Stages. The show won four 2008 HOLA Awards from the Hispanic Organization of Latin Actors. The Smithsonian's National Museum of American History collaborated with photographer Robert Weingarten to create an object-based portrait of Celia Cruz featuring artifacts in the museum. The portrait was unveiled October 3, 2012. In 2013, Cruz was inducted into the New Jersey Hall Fame. In October 2015, Telemundo premiered an 80-episode docu-drama based on Cruz's life, Celia. ^ Pareles, Jon (December 14, 1992). "Review/Pop; The Queen of Latin Music Takes It From the Top". Retrieved January 27, 2014. ^ "Celia Cruz's Shoes". National Museum of American History, Smithsonian Institution. Retrieved 2008-06-09. ^ a b "Her Life". National Museum of American History. Accessed October 7, 2012. ^ Cobo, Leila (July 26, 2003). "Cuban Salsa Sensation Celia Cruz Dies At 77". AllBusiness.com. ^ a b "Music: The Definitive Visual History". go.galegroup.com. New York: DK Publishing. Retrieved 13 December 2016. ^ Celia Cruz; Ana Cristina Reymundo (2004). Celia: mi vida. Harper Collins. pp. 24, 74. ISBN 0-06-072606-7. ^ "¡Azúcar! The Life and Music of Celia Cruz". Smithsonian Institution. Retrieved 2007-11-04. ^ a b "Celia Cruz". Britannica Academic. Encyclopædia Britannica. Retrieved 13 December 2016. ^ Celia Cruz; Ana Cristina Reymundo (2004). Celia: mi vida. Harper Collins. pp. 32–4. ISBN 0-06-072606-7. ^ Knight, Franklin; Gates, Henry (2016). Dictionary of the Caribbean and Afro-latin American Biography. New York: Oxford University Press. ^ Cartlidge, Cherese (2013). Celia Cruz. Infobase. pp. 28–29. ISBN 9781438146072. ^ Scott, O.A. (2009-07-10). "Music and Musicians Still Echo 35 Years Later". The New York Times. ^ Pareles, Jon (17 July 2003). "Celia Cruz, Petite Powerhouse of Latin Music, Dies at 77". The New York Times. The New York Times Company. Retrieved 17 June 2016. ^ Pardillo, Omar (4 February 2003). "Telemundo to Produce Tribute Concert: ¡Celia Cruz: Azucar!". Celia Cruz Foundation. Retrieved 5 July 2016. ^ Ellen Pearlman (April 1, 2008). "Azucar! Celia: The Life and Music of Celia Cruz at the New World Theater". The Brooklyn Rail. ^ Townsend Rosa; Vicent, Manuel (July 18, 2003). "La muerte de Celia Cruz consterna al exilio cubano y a los artistas de la isla". EDICIONES EL PAÍS, S.L. Retrieved 24 July 2012. ^ "¡Azúcar en el cielo!". El Diario de Hoy. July 17, 2003. Archived from the original on October 21, 2013. ^ "Azúcar: Google celebra a Celia Cruz" (in Spanish). Telemundo. October 21, 2013. Archived from the original on October 23, 2013. Retrieved October 21, 2013. ^ Brady, Emily (February 25, 2007). "Amid the Gravestones, a Final Love Song". The New York Times. ^ "Music: The Definitive Visual History". Gale Virtual Reference Library. New York: DK Publishing. Retrieved 13 December 2016. ^ Rosero, Jessica (June 2, 2004). "Homage to Celia Cruz: UC to pay tribute to Queen of Salsa with events, park dedication". The Hudson Reporter. ^ Rosero, Jessica (June 18, 2006). "Viva la comunidad Cubano North Hudson celebrates at the annual Cuban Day Parade". The Hudson Reporter. ^ Rosero, Jessica (May 26, 2006). "'La vida es un carnaval' North Hudson celebrates 6th annual Cuban Day Parade". The Hudson Reporter. ^ Gowens, Otis (2013-10-21). "Celia Cruz, queen of Salsa, gets Google Doodle". AJC.com. Cox Media Group. ^ "Jennifer Lopez rinde tributo a Celia Cruz en los American Music Awards". The Huffington Post (in Spanish). AOL. November 24, 2013. Retrieved November 25, 2013.